Securing tee times, information on courses, and finding deals for great golf in Maine, is as easy as visiting the website for Harris Golf. At HarrisGolfonline.com, eight diverse courses for public play are featured - from nine- and 18-hole historic links to one of the top-end resorts in the state. Six of the courses are within an hour's drive from Portland and three are about a two-hour drive. Sunday River Golf Club to the west is one of those further drives but is well worth the trip. Located in the Bethel-Newry region of the state with a ski resort nearby, the setting is as spectacular as it gets. Holes wind through forested, rolling terrain with the Mahoosuc mountain range serving as a dramatic backdrop. Rates are appropriate at $129 on the weekends during peak season but seasonal discounts apply. A trip to Sunday River in the fall is a must. It can not only save a few bucks but also provide a truly awe-inspiring experience. 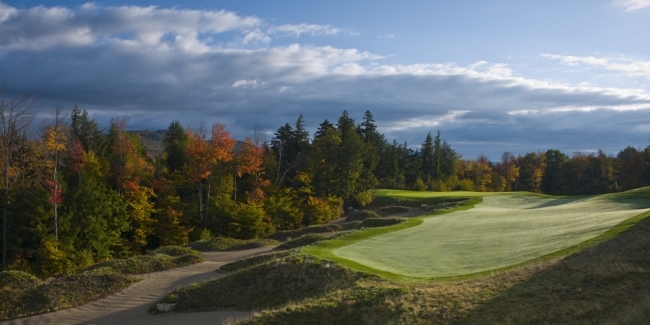 Designed by Robert Trent Jones, Jr., Sunday River has received several accolades as one of the top courses in the state. Golf Magazine named it one of the top 100 courses you can play in America. Another top architect's work - this one going way back - can be found about 140 miles east of Sunday River. Donald Ross' Penobscot Valley Country Club (1924) has remained true to its roots. It received a new clubhouse in 2001, but in 2008, the course underwent a restoration project based off the architect's original drawings. A detailed PDF file of the guidelines and mission statement for the project can be found at the Harris Golf website by clicking on Penobscot Valley, then "The Course" tab at the top of the page (scroll down for the link). A Ross restoration specialist, Brian Silva, designed Old Marsh (2008), in Wells, Maine, just off I-95 south of Portland. Old Marsh, which has a Florida feel to it, is an arousing combination of different architectural styles. In the yardage book for the course, Silva talks about creating the modern course with the ideas of the father of American golf architecture - C.B. MacDonald - in mind. "Many hurdles were overcome in creating such a setting - it was my job to make the course a joy and challenge to play," says Silva. "This was accomplished via random bunkering, kick-slopes and raised green settings that often fall steeply into deep bunkering and with loving adaptations of tried-and-true golf forms, angles and strategies of MacDonald and his protégé Seth Raynor... the end result is a golf experience unique to New England, and worth waiting for." While tee times to play any of the Harris courses should be made by calling the representative golf shops directly, Harris will customize a multi-night, multi-course package upon request. To do so, call the Harris Golf main office in Bath at 207-442-8725. Harris also offers a few specials throughout the year. In the past they have offered a "Preservation Pass" (for just $50) which included 18 holes and a cart at Sunday River, Old Marsh, the Bath Golf Club (Bath) or Penobscot Valley PLUS a bonus pass to play 18 holes at 9-hole layouts Mere Creek (Brunswick), Highland Green (Topsham) or Freeport Country Club (Freeport). They have also run a "Big Daddy" special as a springtime/Father's Day promotion which provided a discount at Sunday River, Penobscot Valley, or Old Marsh. The Harris portfolio also includes the not previously-mentioned 9-hole Wilson Lake Country Club (1932) in Wilton, and Falmouth Country Club, which hosted a Legends Tour event for the second straight year in Sept. 2013. Falmouth is a private club and can only be played as a guest of a member.